All I can see are breaking waves. I stand up on the lazarette and lean onto the dodger to steady the binoculars. 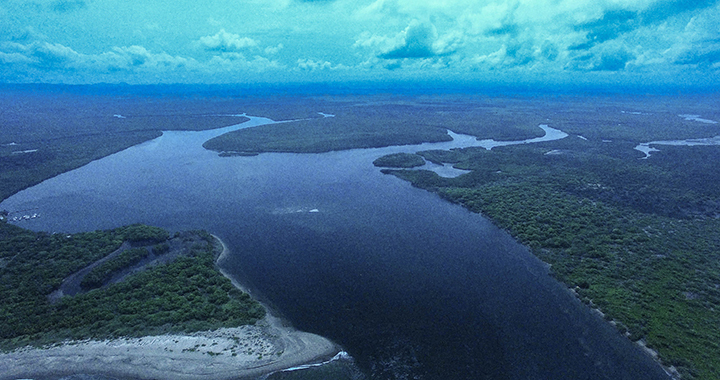 There is supposed to be a channel clearly marked with lighted buoys, our first entrance to Nicaragua. We left Honduras early and had a favorable current pushing us south from the Gulf of Fonseca, but we had planned to arrive at dark and use the buoys to guide us in. There are no buoys. There’s a tall thatch hut on the beach. Other than that, all I can see are the backs of waves, breaking and barreling, their spray-painting an ominous haze over the beach. The backs of waves are deceptive: I can see the smooth roll before they break, but I can’t see the faces to know the size. Not that it matters—they would all break our boat on the shore. The narrow estuary entrance to Aserradores. The channel, marked by the riffles exiting the estuary near the top right of the photo, is flanked by rocks to starboard and breaking waves to port. I’m grateful for the little bit of light left in the sky, but I’m overwhelmingly tense with the anticipation of a channel far more complicated than the guides led us to believe. I try the marina on the radio. “Marina Puesta del Sol, Marina Puesta del Sol, aquí velero Oleada.” Only silence in response. We are sailing directly for shore, and there is no sign of the channel, although our poorly detailed charts indicate we should see it to our right. I watch the depth sounder tick up from 100 feet to 50 feet. We still have full sails up because we have read that the current coming out of the estuary can run at over six knots at max ebb tide, and we might need the sails and the burst of wind that accompanies sundown to fight through the current. 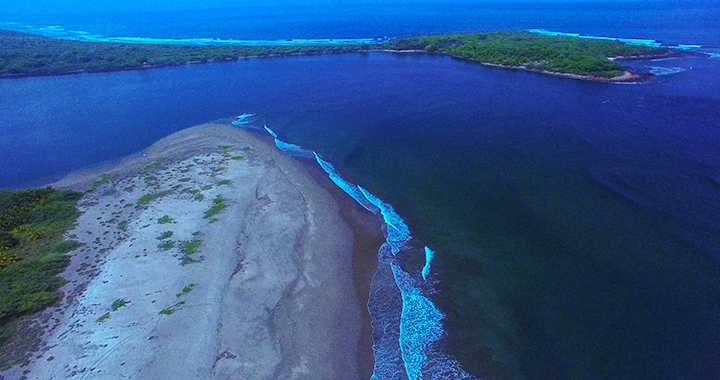 We have 15 minutes of daylight left to navigate the breaking waves and find this hidden estuary in northern Nicaragua. Now we are so close to shore that I can look sideways at the waves breaking on the beach. The water under the boat is choppy, peaked, and swirling like whitewater in a river. Josh throttles up our motor and it strains to keep the boat into the current. We see the estuary emerge on the starboard (right.) My palms sweat as I hold my breath, scanning methodically for the channel marker. I still see only water, waves, and sand. “I’m just going for it. I think I can see where we need to go.” As the sun slips under the horizon, Josh turns Oleada into the on-rushing current. He’s unflappable and focused. I perch tensely on the rail, still looking for the buoys. Although we can see the estuary, we cannot see the channel, so we don’t know if we will run into reef or sand. I haven’t been this scared for our boat since we were caught in breaking waves in the northern Sea of Cortez six months ago. The water in front of us tumbles out of the estuary, meeting the ocean and creating waves as it falls to the sea, like a whitewater rapid. The way the water falls makes it look like its running over rocks only inches below the surface. With her sails full from the dying breeze, Oleada cuts steadfast into the current. Josh keeps the boat in the waves, centered between the shore with the breaking waves to our port and the rocky shore of a long barrier island to our starboard. The channel is only a few hundred feet wide. As the bow pushes through the last of the choppy water, I see it: a green buoy, tucked deep into the channel. I shout and point it out to Josh. We can still feel the tug of the tide on the boat, but we are suddenly in the dead flat calm of the estuary. We motor into a light breeze, which has shifted to our nose. After we clear the whitewater at the entrance, we follow the few buoys through the channel to the left, along a sandy beach that drops steeply to the swirling green water. We can see tiny waves breaking on a reef just outside the channel to the right. We roll up the jib and I drop the main sail as we approach the dock with almost all the light gone from the day. Looking back at the esutary entrance from just inside the channel as the sun drops. It’s a mess of whitewater and breaking waves; the channel here is invisible. “Holy sh*t am I glad we didn’t do that in the dark.” I smile with relief at Josh as I tie fenders to the boat. The marina is only a few wooden docks sticking off the land in the calm waters. A tall and imposing man waits at the last slip, a small shotgun slung backwards over his shoulder. As we swing into the dock and an approaching thunderstorm rumbles behind him, he offers a huge grin and a warm, bellowing voice. The beautiful Aserradores estuary. The marina is on the far left, and the breaking wave in the center marks a reef. It was love at first welcome for me in Nicaragua. The depth of the economic poverty in Aserradores and the surrounding pueblos was only paralleled by the warmth of the people. 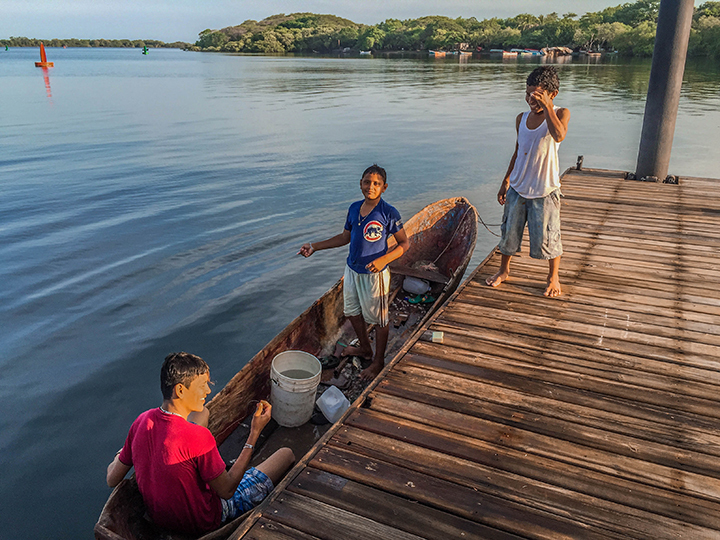 Nicaragua’s northern coast is far more rural and poor than anywhere we had yet visited, lining up with the statistic that Nicaragua is Central America’s poorest country. The poverty is laid as bare as the children’s feet. We walk down the dirt roads on this rural piece of land. We share the road mostly with cows and chickens, people on bikes and horseback, and the very occasional car. I love traveling by bike, and here I was charmed by the use of a bike as a two-person vehicle: one person sits sidesaddle on the top tube of the bike while the other pedals. It looks uncomfortable for the person catching the ride on the metal frame, but people seem to have found the balance and the comfort after a lifetime of practice. 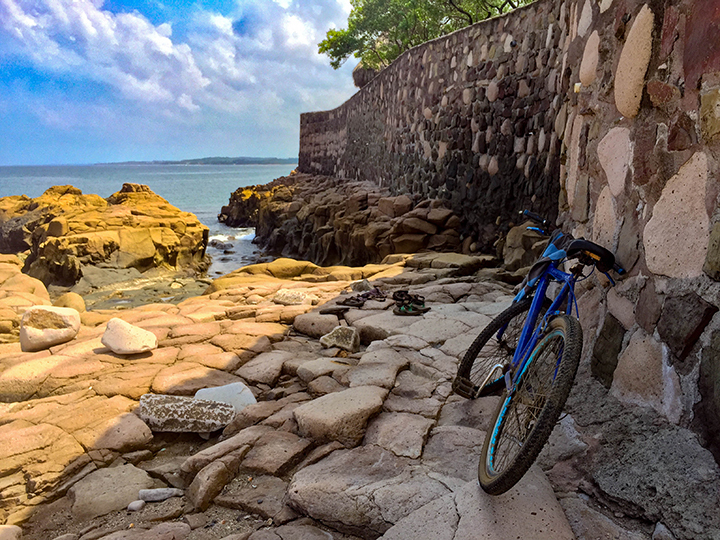 This bike brought two brothers to the shore to collect limpets off the rocks for bait and food. Houses are either lean-tos, cobbled together with tin, cardboard, and anything else stiff enough to function as a roof or a wall, or one room cement cabins, the identical progeny of an international aid project. The houses are clumped tight together, little plots with winding roads connecting their doors. There are many dogs, but all seem well-fed, and they barely look up at us with our dog from their languid lounges in the oppressive heat and humidity. We are newcomers, and we are on foot as we explore the winding roads outside of the marina, so we take in everything slowly and at the local speed. Everyone, even the kids walking the road as they move to and from the local school, makes eye contact, smiles, and says hello. 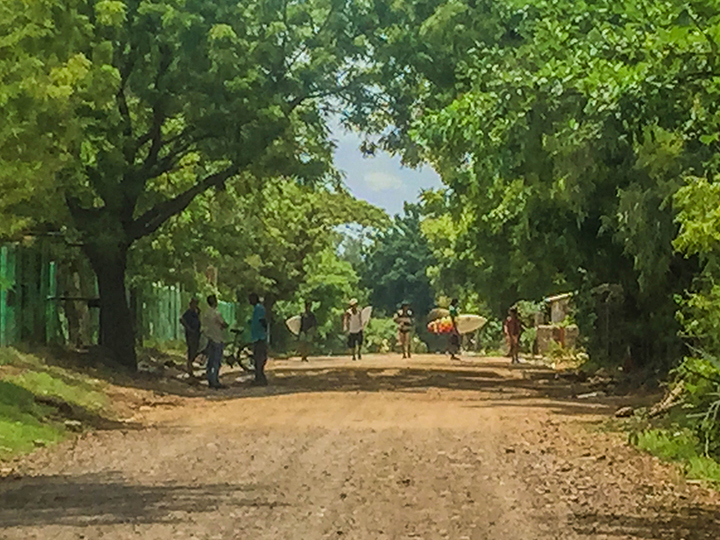 This low-resolution photo captures the laidback feeling around Aserradores: local kids walk the dirt road to the surf break, unworried and unhurried by traffic. Men stand chatting in the shade with their trusted transport, the bicycle. For all this poverty, there is pride in tidiness. There is barely any trash, at least relative to what we’ve seen in Mexico and especially Honduras. Each of the tiny houses or shacks has a front yard of dirt, but most are meticulously raked, with a pile of leaves in the center every morning. There’s no garbage disposal service, so trash is burned among the leaves in the swirling, toxic greens and blues of melting plastics. 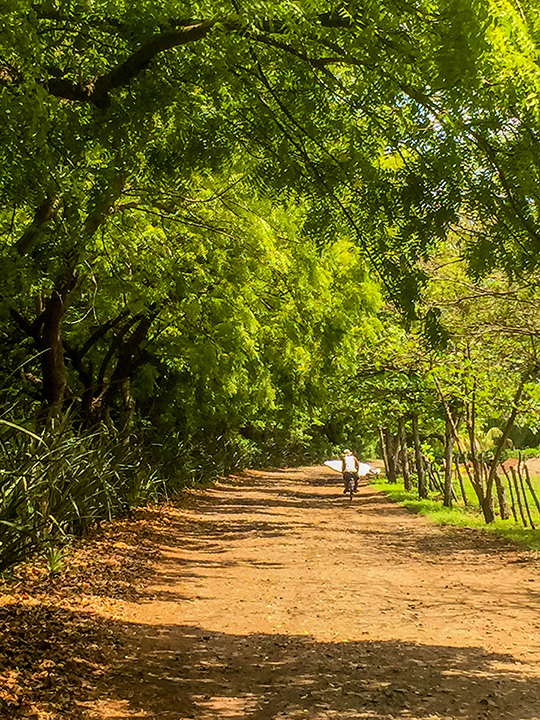 Nicaraguans are ingenious with the barren earth around their houses, raking and sweeping until it glows like terra cotta tile. But the sienna dirt thwarts them in the afternoon winds, whipping around under the mango trees heavy with fruit. It stings my calves and my eyes as we walk out the main road. The trees are still green, but the dirt makes me wonder how this piece of country is surviving in the drought that often accompanies an El Niño. The cows let me know. We find a small herd, only about twenty, resting in the shade of a tree by the road. Their hip bones protrude through their skin, and I can count the ribs on each individual. The grass in the field next to them is dry and yellow. 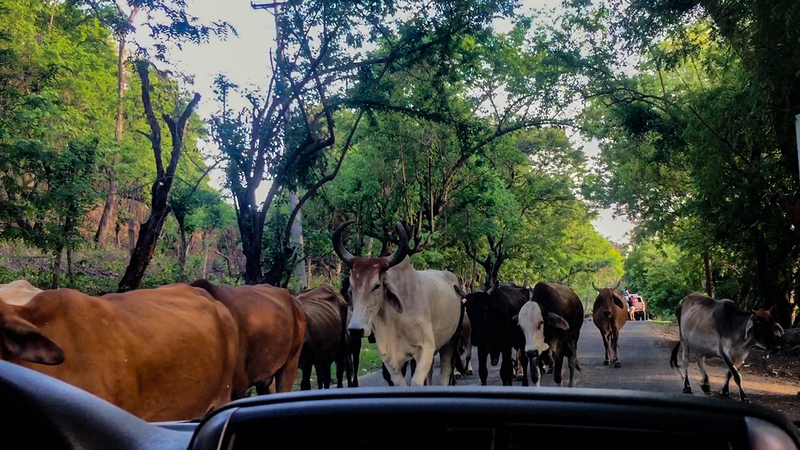 Skinny cattle, driven on horseback, make their way through a few trucks on the road in Aserradores. This countryside holds a history of small scale cultivation, as I learn from Juanita Garcia Ureza. She was born and raised in the tiny pueblo only a few miles away. She tells me that the area once was only a community of fishers. We don’t have a local identity anymore, she says. Her daughter giggles wildly from a corner where the gruff-turned-charming bartender plays with her as we talk under the tall thatch roof of the marina restaurant. Occasionally a bug sizzles in one of the fly zappers as the air hangs around us. A few things have improved for the communities, making the area more livable, she tells me. Namely, the school used to be terrible. But the owner of the marina, who had left Nicaragua and found success as businessman in San Francisco, sailed back to his roots (he became a sailor in the Bay as well) to found the marina and fund a new local school. In the meantime, foreign aid brought electricity and a solitary paved road to the area. But there’s a cost. “Everyone here was a fisherman. Generations of families lived here—and all were fishermen. But now, it’s divided. We don’t have that community anymore.” A few foreigners have arrived, and with them a trickle of surfing tourists searching for the next perfect wave. There are only a couple of places to stay and one other restaurant, a tapas bar opened by a Spaniard living in Nicaragua for his work in the local aquaculture industry. But somehow, Juanita feels that the fabric of the community has eroded since she was little. It’s not just the foreigners—the fishermen disappear as the fish become less plentiful. (above) En route to the break via bicycle. 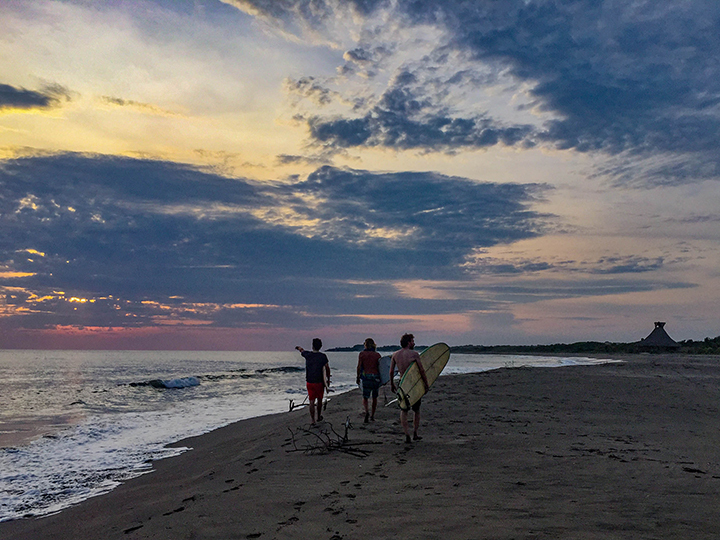 As the fishers fade, a new generation takes to the sea as surfers. (below) Surfers checking the break at sundown. The school is better; the roads are better. But a sense of community is gone. Meanwhile, another threat lurks in the shallow wells here: salt water. After walking the dusty roads, I wash off my feet using the dock hose, the spray from the nozzle sharp on the skin on the top of my feet. It’s hot and sticky and the water is instant relief. Three pairs of eyes watch me closely. There are three boys in a canoe, silently dropping hooks and a fishing line into the water. When I start to chat with them, the littlest boy asks “Agua dulce?” Fresh water? I tell him yes. “Que rico!” he exclaims in a whisper, his eyes wide with wonder. How luxurious—you get to rinse your feet with drinking water! A few minutes later, from inside the cabin I hear the squirt of the hose nozzle and insuppressible giggles. I step outside and the kids look up apprehensively from the dock, where they’re turning the fresh water hose on each other in guilty bursts. I smile and tell them they can use it, deciding that I will worry later if this gets me in trouble with the marina. A chaotic water fight ensues, but with the underlying purpose of cleaning, each boy wiping and scrubbing his face and skin. I bring them a bar of soap, and they quickly cover themselves in suds, laughing maniacally with delight. I wonder if they have ever had a fresh water shower. Fishing and giggling from their wooden canoe. Josh and I rent a car in the nearest city, Chinandega, and set out to see even more of the surrounding area. We find our way north up the coast, hang our first left, then travel a flat dirt road back toward the coast. This passage to the sea feels entirely different from the road to Aserradores: it’s denuded of all trees, with only a few bushes. Long gray industrial buildings line one side of the road, complete with guarded gates and no identifying names. After kicking up powdery dust on this new road, I realize that we are paralleling another estuary, but this one more dense. When I look it up later on the map, we are at one end of a lacy finger of the Padre Ramos Nature Reserve. But almost all of what we see is barren, wasted land. “Look, they have trash pickup here!” Josh exclaims when we start to see the 50 gallons blue drums lining the road. But as I watch, a woman scoops into one of the barrels and walks back toward her house—with a large bowl of water. It’s not just the blue drums: any large, watertight receptacle sits patiently on the side of the road, apparently having just received a load of fresh water. At every house, at least one person makes trips from barrel to home. Some carry five gallon buckets, others simply use bowls and cups. Most barrels are carefully covered so as not to lose any water to evaporation and protect its cleanliness. The blue drums waiting outside of one room, cement houses. Later, as I talk with two local young women, Lisseth and Lalesca, they tell me that everyone used to have their own well. You didn’t have to dig deep—only 10 to 15 feet. But in the last 10 years, many of the wells became salty. 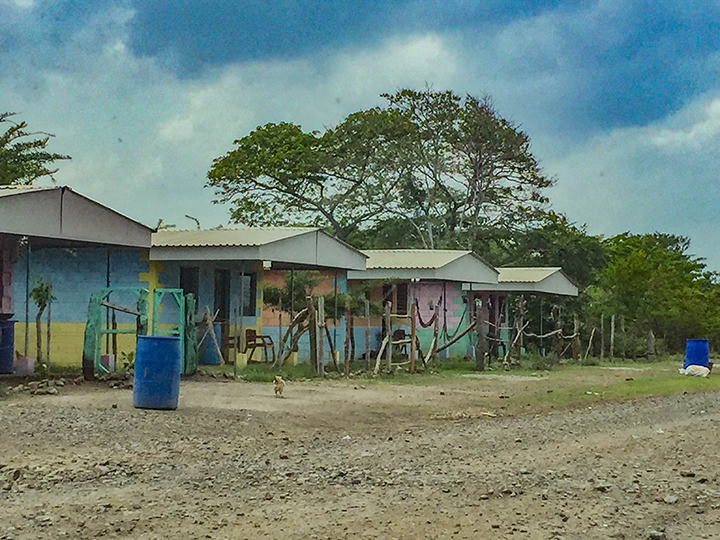 When we arrive to the coastal hamlet of Jiquilillo, one hostel and a few shacks slouch impossibly close to the water. Any storm surge over a few feet would wipe them out. People stare at our car until we lower the windows, letting in the heat but also the curious gazes and friendly smiles. Fishing boats are stacked tight next to each other on a shore that opens up in front of us. 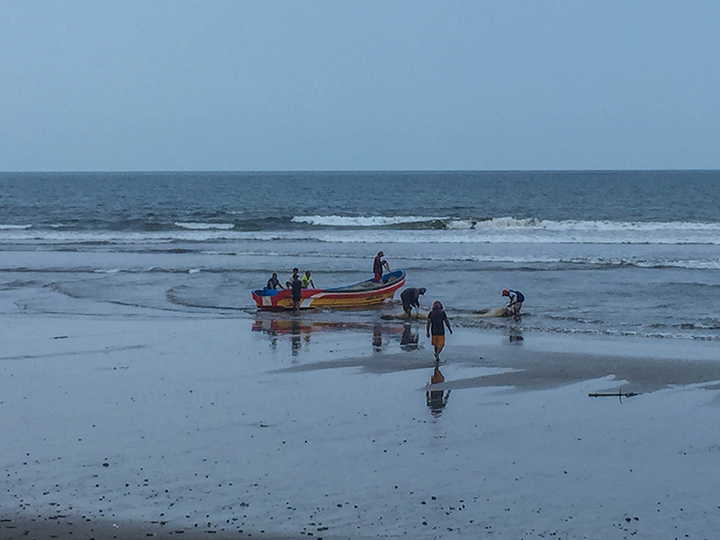 Men help each other drag the boats in and out of the surf. Kids and dogs circle the feet of old fishermen and young mothers in the nooks of shacks and pangas. 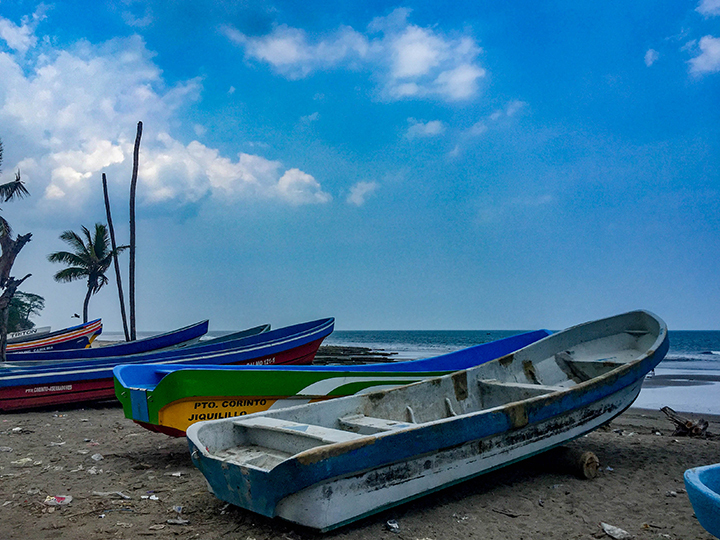 (above) Boats waiting for their turn at sea, Jiquilillo. (below) Fishermen survive because of community. Here, many help a fisher by preparing nets and launching the boat. There’s a tiny, Caribbean blue shack with a crude, handwritten sign on the front: pan de coco. We pass it once, aiming to drive all the way to the end of this spit of land, but where google maps tells us there’s a road, the two-track disappears into sand, scrub, and the incoming tide. (This would become a theme as we navigate further south—both with google maps and our charts boldly declaring passages where none appear.) This tiny little spot of settlement feels both busy and abandoned, with many inhabitants amidst and a feeling of impermanence, of limbo. We turn around, and as we pass the blue shack I see a fleeting shadow. Pulling over, I find the woman who owns the tiny business, a big woman of African descent, with the lilting roll of Caribbean Spanish. With palpable sympathy she tells me she already sold out of coconut bread (I would later learn that this bread is renowned on the entire northern coast.) I ask her about the water, and she said the water has been getting salty for the last five years. I linger in her warm presence, and she encourages me to come back tomorrow for bread. Eventually we catch the pipa, or water truck, on our way back out to the main road. It looks like any industrial water truck, an oblong cylinder on wheels, and it stops at each home to fill the barrels. We make our way back to the greener, paved road that takes us toward the marina, turning off to find another beach, finally finding the tapas restaurant. The owner, a young and vivacious Spaniard, can see that I am enamored with this stretch of Nicaragua. When I inquire about his process for settling here, he offers his advice. 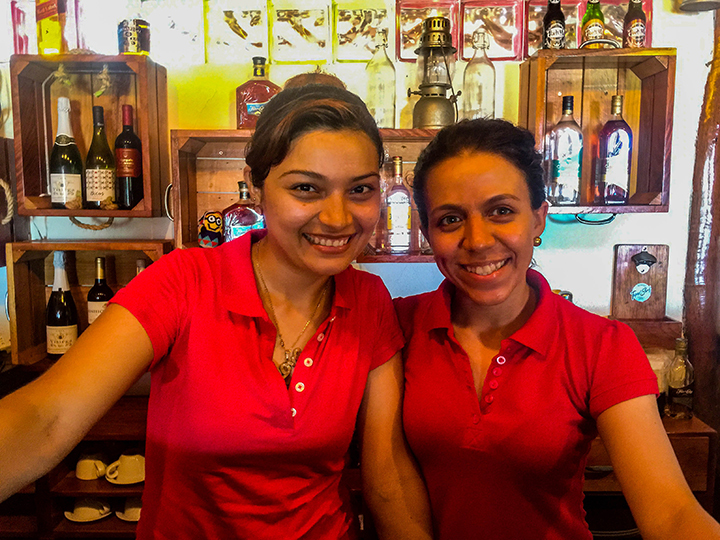 Lisseth and Lalesca, two local young women who now work in tourism at the tapas bar. Lalesca is studying to be a nurse. 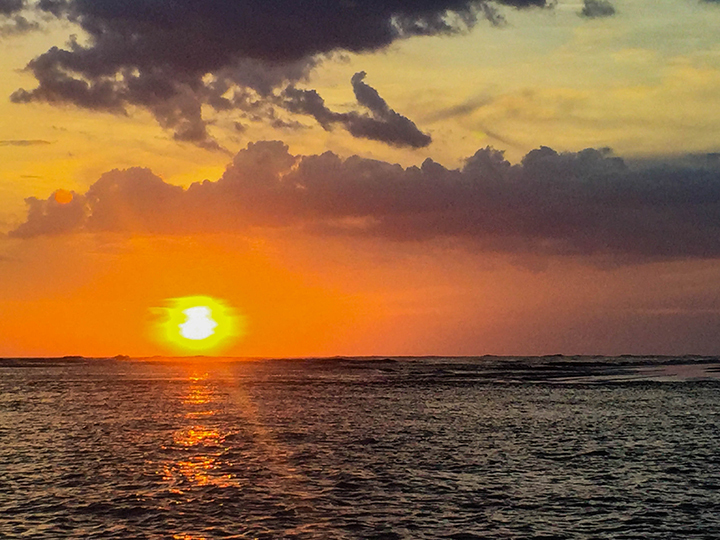 In northern Nicaragua, the future is here. The people, and their livelihoods, already must deal with a drought that has continued, off and on, for two decades of El Niño oscillations. People rake their dirt yards and send their kids to school. But life is tougher when all the water must fit in a 50-gallon drum and be spooned out carefully for an entire week. And no government or aid organization has yet stepped forward to find a better solution. Already, the water truck is a better alternative to drinking saline water—but it hampers life when water is this hard to come by. As we drove back to the marina, I thought about our desalinator on our boat. It’s a complex and finicky piece of artful machinery that churns out six gallons of fresh water per hour. There are other systems to desalinate water: some involve only a couple of buckets, hoses, and a handmade membrane. As the vast Pacific Ocean came into view, I wondered about the simplest solutions. Even if water gets to the people, the cows are still out of luck. Many people here still use horses for transport and oxen to drive goods to market. How will they feed and water their beasts of burden? It’s the difference between adapting and surviving: the coastal people have survived untold political turmoil and uncertain, starving times here. Rural people in particular are adept at coping with changes in the climate. But to adapt, to preserve a way of life, requires coordination, including with the state. It’s hard to coordinate when you are shuffling water down a dusty driveway. 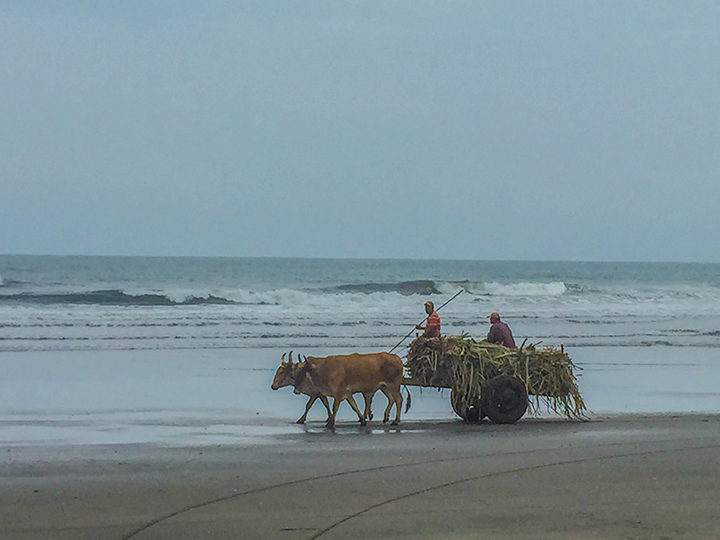 Two oxen carry a load of sugar cane along a popular beach for surfing. That night, a massive thunderstorm hung over Aserradores. The thunder rumbled constantly for two hours—it sounded like a heavy cart rolling down the planks of a wooden dock, cracking and growling and murmuring without pause. It was unlike anything I had ever experienced. The lighting flickered without a break, lighting up the sky and the estuary. But there was no rain.